Originally, kippers were made by salting and smoking small out-of-season salmon, according to the U.N. Food and Agriculture Organization, but now these tasty treats are made by soaking herring in brine and then smoking them. 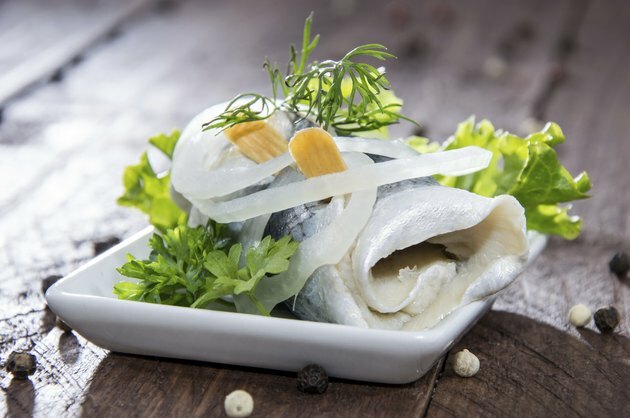 Because herring are one of the types of fish lowest in mercury and higher in omega-3 fats, they are a good choice to help you meet your recommended two servings of fish per week. Don't consume all of your herring in the form of kippers, however, since these are high in sodium. Each 3-ounce serving of kippers, or about two medium kippers, contains 185 calories, 20.9 grams of protein and 10.5 grams of fat, including 2.4 grams of saturated fat. This is 42 percent of the daily value for protein, 16 percent of the DV for fat and 12 percent of the daily value for saturated fat if you follow a 2,000-calorie diet. You'll get a vitamin boost when you consume a serving of kippers. Each 3-ounce serving provides 267 percent of the DV for vitamin B-12 and between 15 percent and 20 percent of the DV for niacin, riboflavin and vitamins B-6 and D. You need vitamin B-12 for forming DNA and healthy red blood cells, and all of the B vitamins help you turn the food you eat into energy. Vitamin D is important for absorbing calcium, proper immune function and reducing inflammation. Eating kippers also helps you consume the recommended amounts of essential minerals. Each serving provides you with 28 percent of the DV for phosphorus, 11 percent of the DV for potassium and 64 percent of the DV for selenium. Without phosphorus, you wouldn't be able to form DNA or the red blood cells you need to bring oxygen where it is needed in your body. Potassium helps counteract the blood pressure-raising effects of sodium, and selenium acts as an antioxidant to prevent cell damage from dangerous free radicals. Your body can't produce omega-3 fatty acids, but it needs them for brain development and heart health. The Academy of Nutrition and Dietetics recommends you consume at least 500 milligrams of a combination of eicosapentaenoic acid and docosahexaenoic acid, two types of omega-3 fats, each day. Each serving of kippers provides you with 1,828 milligrams, making them an excellent source of these healthy fats. The main drawback to regularly eating kippers is their relatively high sodium content, since a high intake of dietary sodium can increase your blood pressure and thus your risk for heart disease. Each serving contains 781 milligrams, or 34 percent of the maximum amount of 2,300 milligrams per day recommended for healthy people. People with high blood pressure should limit their daily sodium further to 1,500 milligrams.